Since 1999, Bergen Designs has been delivering our beautiful natural stone memorial benches to our customers in Arizona. Because the climate of Arizona and Colorado are similar, our memorial benches and garden benches are more appealing to our Arizona memorial bench customers. Our memorial benches are also more durable than man-made, cheap concrete benches – and they will hold up against the heat of the summer and temperature changes throughout the day. 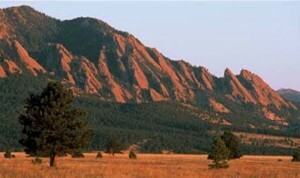 Plus, the natural red stone color of our benches fits perfectly in the beautiful Arizona landscape. Customers from Phoenix, Scottsdale, Tuscon, Fountain Hills, Flagstaff and all areas in between have been ordering beautiful memorial benches from Bergen Designs for over 17 years now. Bergen Designs is based in nearby Colorado, so shipping to Arizona is easy and included in the price of each memorial bench, along with an inscription (up to 3 lines of text plus the name and date). You can enjoy these beautiful natural stone memorial benches in any environment in Arizona from private memorial gardens, churches, cemeteries and open space park settings. Installation and assembly takes less than an hour to complete once your memorial bench arrives – and it will remain beautiful as the day it was created despite the often hot weather often found in Arizona. Attached is the bench my brother set up for me yesterday. I am so proud of it. Thank you so much. Also, thank you for being such a pleasure for my Mom to work with. She would forward some of your e-mails to keep us informed and she also mentioned how nice it was to work with you. The text you give us for inscription is engraved into the natural stone, making these memorial benches a beautiful personal reflection of your loved ones memory. 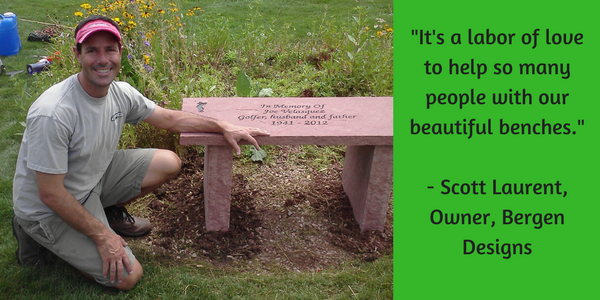 Sample inscription on our memorial benches. Sample of Designs you can choose to add to bench corner at no additional charge. 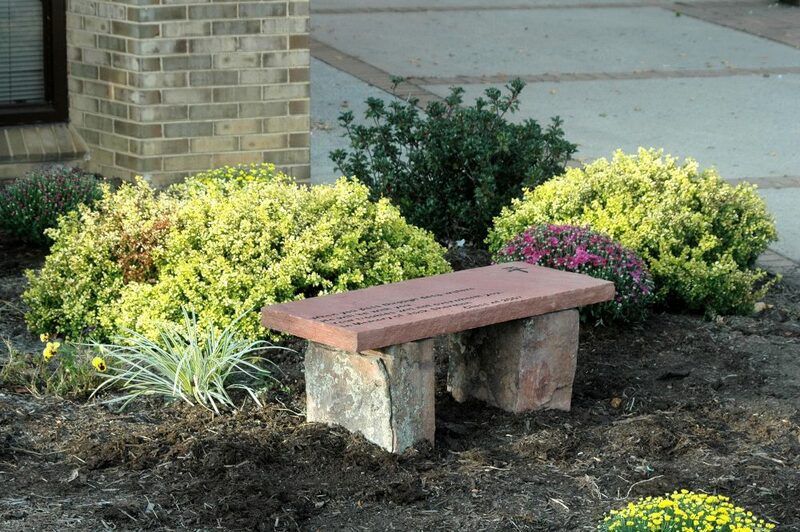 Bergen Designs is currently adding 3 garden stones with design to every memorial bench purchase ($159.00 value). These garden stones are made from the same stone as the bench and family members can use the stones in their own personal gardens to help reflect on how beautiful the bench is. Colorado Red Flagstone fits perfectly in the Arizona landscape. Bergen Designs is a family owned business and since 1999 we have been creating beautiful benches for customers throughout the United States. Here at Bergen Designs, we have a commitment to bringing you the most unique, natural, one of a kind benches that you can enjoy for a lifetime. 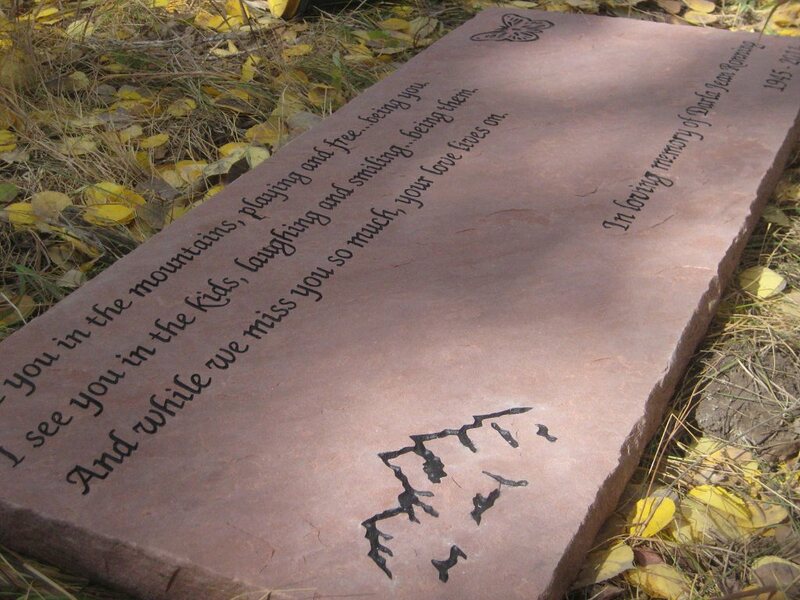 From the Mountain to You- From the Rocky Mountains comes the hardest Red Flagstone in the world and it allows us to create the most natural looking benches that are so much more appealing than the man made look of concrete memorial benches or granite memorial benches! Most benches you find online are imported from overseas where at Bergen Designs they are Made in the good old U.S.A.! Shipping has never been easier- Shipping to anywhere in the Continental U.S. is included in the price of each bench. We use the largest freight carrier in the world and that allows us to include shipping in the price no matter where in the country you live. In some very rural areas there might be an extra charge but that does not happen often. Set up of the benches made easy- Along with each bench comes the instructions for assembly that takes less than an hour to complete. 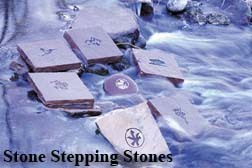 An epoxy is included and helps insure a bond with the top to the bases. A foundation is not needed underneath the bench unless the bench is being installed on a sloping hillside or an area subject to flooding. 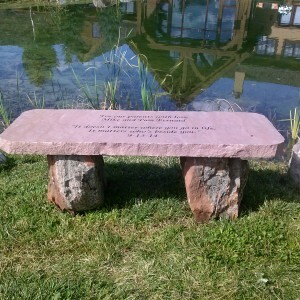 Inscription included with Memorial Bench- Included in the price is the inscription which you can have up to 4 lines of text including name and date if needed. We also have many designs such as flowers, birds, cross, etc. for you to choose from. Once the order is placed with us, we work up several mock designs showing the text you desire in several variations for you to choose from.